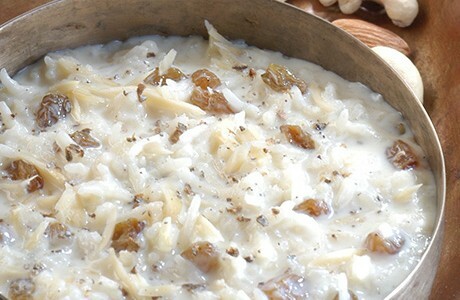 This quick and easy Indian dish is a delicious twist on the classic rice pudding. Served cool, and enriched with almonds and cardamoms, this dish is the perfect dessert after a hot curry. Bring the milk to the boil. Then add the rice and the green cardamoms. Cook for 15 minutes stirring continuously, until the milk is fully absorbed and the rice is tender and broken. Add the raisins and condensed milk. Cook, stirring regularly for 15 minutes until the consistency is thick and the mixture sticks to the ladle. Garnish with almonds. Refrigerate and serve when chilled.